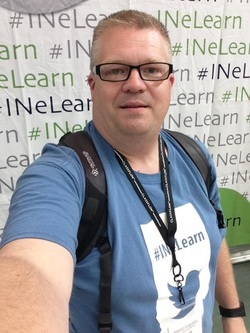 With 23 years in professional education, I consider myself an educator and innovator, constantly looking to improve what I do in the classroom to better help students learn. Starting in 1993 with my first professional teaching position in southern Illinois, I have taught a variety of English classes at all levels and courses in several different facets of journalism, as well as advised student yearbooks and newspapers. After four years in Illinois, I returned to Evansville to take a position at Mater Dei, teaching English and advising their yearbook and newspaper. There I also assumed the role of technology committee co-chair, overseeing the school's investigation of a one-to-one program. In 2005, I bravely transitions to MD's West Side rival, moving up the Hill to take a position at here at F.J. Reitz High School, taking over their journalism program and teaching inclusion English. Along with teaching at Reitz, I teach Composition I and II courses at IVY Tech and the University of Southern Indiana, my alma mater. These college classes, besides providing a nice side income, have given me a new perspective on my secondary teaching. I see where the students are going to be, what they will be expected to do, and what skills are necessary to complete college successfully. This allows me to tailor what I do in my high school classroom in such a way that my students have more tools for their post-graduation life. Another role I have taken on is that of on-line educator, teaching a wide range of English classes for Indiana Cyber Academy. This has also broadened my view of the traditional classroom. Not only have I seen the power and validity of online education, but it has enhanced my ability to work digitally with my brick-and-mortar students. My toolbox of digital tools is grown through this experience. For more than a decade, my yearbooks and newspapers have received critical acclaim, with numerous students receiving local, state and national awards. I am an active member of the national Journalism Educators Association and have spoken at several of its national conventions. In an effort to improve scholastic journalism, I am on the planning committee of the Southern Illinois School Press Association, to give scholastic journalists more skills and a chance to showcase their work. With SISPA, I chair the on-site competitions and have worked with the yearbook contests. Locally, I have worked closely with the University of Southern Indiana's Media Day. I am a father of four, Noah 19, Makenna 9 and 4 1/2-year-old twins Landon and Lilah. When I'm not playing playing dress up, having tea parties or refereeing sibling battles, I enjoy reading young adult fiction and practicing photography. Call it an occupational hazard, but I love to read. My tastes generally fall in to political and historical fiction, but lately I have found myself reading young adult fiction, much of which has been suggested to me by my students. This has been a great experience for me, to share with my students the things that they enjoy and to gain some insight on what drives and shapes them. As you can tell my time is limited and the chance to read doesn't always come easily or in large blocks. Over time, I have come to enjoy audiobooks because I spend a lot of time driving (each morning I have a 20 minute commute from Warrick County to the West Side). Some might say that listening to books being read to me cheapens the experience, but I have found that it not only has given me more time to take in works that I wouldn't have time for, but it also has given me perspective on how a story can be realized. Readers take on the voice and persona of the characters. Granted, this is something that we do when we read, but it is interesting to see how the author envisioned the story, the flow of the action and the personalities of the characters and to compare that to what I expected or would have created on my own if I had read it. Of course, I have taken to eBooks as well. These handy, digital books have increased my reading time as well. I would not necessarily carry a book with me everywhere I went, just in case I had a few extra minutes between the kids' events; but I do always carry my iPad. Now I always have a book, or access to a library, at all times. When those few precious, unexpected moments to read arise, I am ready to go. Many complain that eBooks take away from the reading experience, but I disagree. Yes, I do like the feels of paper in my hands and it does give me a sense of the pure joy of reading, but, for me, convenience wins out. In the end, the books is no different, the story is the same and the author's abilities (or lack thereof) is still just as clear.